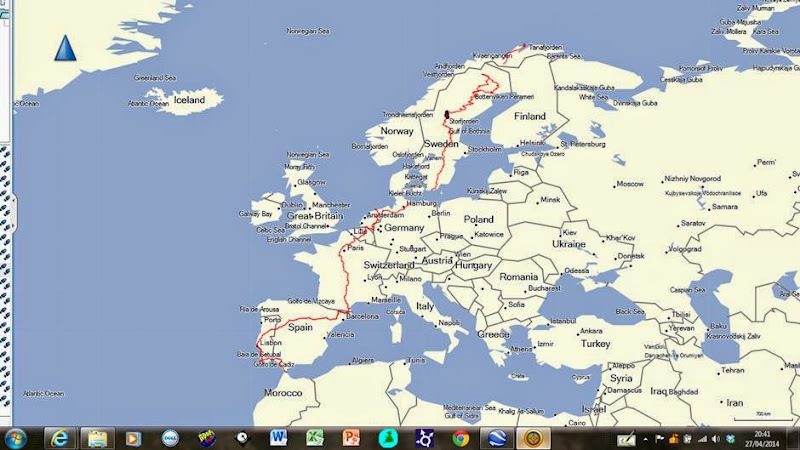 Trans Europe Trail Ideas ??? Discussion in 'Europe' started by Orujo, May 13, 2011. Is there such a thing as a Trans European Trail like there is in America with the TAT? Is this just not possible in Europe? Alternatlvaly, I would love to do a coast to coast in Spain all off road, would this be possible? There are plenty of walking routes but I think id burn in hell if I rode the Camino de Santiago on a trail bike! I think for Europeans the main port of call for long distance offroad trails is obviously Morocco. While I think Morocco is the business it is a little extreme/intense for going every year. I suppose what I am looking for is a extreme long distance offroad adventure where the only thing that is extreme is the riding, thus, aside from the riding the experience is not so extreme i.e. "normal" hotels, campsites, food, hospitals, shops, restaurants, culture is all what we are more comfortable with. Does this make sense? So, the dream would be a set of maps/books/GPS way-points of a European route that is 90% off-road. Anyone maybe retierd or lost their gjob, there is an idea for a new buisness venture! As far as I know this doesnt exist. Any ideas? There is one tour company that offer a Trans-Spain tour and I seen a post from these guys that arrange a similar spin, such as wipe your own arse. While these are great my dates/budget may not line up with these. What are people's thoughts on finding offroad routes in a foreign country? Do you really need a local contact? I was previously searching for routes in Northern Spain, I found the post below and subsequently bought the TBM back issues, but JMOs routes (at least in Northern Spain) just appear to be a bit of a back road bash which is fairly straight forward, I was more looking for information on where to find start points for good pists or what maps I need. So any ideas on where I can find a Camino de Trail Bike? You know, on the long haul back from Portugal, I was thinking along these lines. North to South or West to East, there's always regions where trailriding is restricted or completely illegal. Unless some can spend years mapping trails going the right way, you will need local knowledge. And the will to share. Which will be a problem as no trailrider wants an invasion on 'his' trails, upsetting the local treehuggers, resulting in trails getting closed. It's sad, but I'm affraid that's the way it works in our overcivilised and overpopulated part of the world. In the end, I think getting invited by local riders would be the way to go. Grumpy old Man likes this. I did this in 2007 - an off road trip from the North Sea coast in holland to tarifa in Spain. 4 weeks of riding, 6000km, probably 80% off-road. Have plans to extend the route to north cape to make it northernmost point to southernmost point. Life took me to Africa but now I'm back. Let me have a pm if you're interested. Claesson, RandomSmafu41 and SkookumWilly like this. TET......Germany and Austria are going to spoil the party......nothing new there then hey! Well, North America has the TAT running east to west and the continental divide trail north to south so why not a north cape to tarifa and an Atlantic to Black Sea coast to coast in Europe? Risk is it becomes a "motorway" and gets overused or someone even cannonball runs it. On the up side it would get bikers from across Europe cooperating to put together their sections. Zrile and Pelle like this. A great idea but so big that I think it has to be a team effort. Spain is complicated as each region has its own rules and regs, which also change by the season. See my blog for some generic details on this. But it's impossible to keep up-to-date as so much is changing, tarmac, new nature reserves, new laws . . . Better to think roughly south-west to north-east, passing south of Madrid.Much more interesting scenery and, mosty, better weather. What do you call extreme riding? We trail ride a lot in Southern Europe taking the bikes in the van and riding out from it in all directions before moving on. Some days we never get more than 20km from the van others we get up to 75-80km in a straight line.. If I load all my routes into Memory map there are not so many gaps from Normandy down to Faro but I doubt there would be any exteme riding between some of these tracks. I'd suggest getting memory map for your PC/laptop and start looking at how many flat/agricultural areas there are in Europe, these will mostly have straight forward easy trails with many junctions which will mean travelling from A-B will often more than treble the distance. What bike would you consider using for such a trip? I've just added up the approx distance joining track logs to make a route from Normandy, Pay De Loire, Limousin, Lot, Carcasonne, Eastern Pyrenees, Andorra, Zaragoza, Burgos, Miranda De Ebro to Faro and it's 8,000km. I used 23 different track logs to make this route and made an average to cover the gaps. We did plan a ride north to south in Spain and that was about 1300km but much was through farm land using dirt roads that pretty much went the direction you'd need to head. Well,,judging from this and the pms I'm getting there seems to be some interest in the idea. Ive used memory map for planning before, buying the package that allows you to choose which french grid squares you want to use allowing one to create a long path across many areas. I'm happy to act as a single point of contact and TET repository for contributors from across the continent. I am fairly handy with gps and mapping and have used mapwel extensively to create a uploadable map rather than relying on importing tracks onto units. I used these successfully running the Red Ball Runs and the Long Way South. i see the route as being for those of us that enjoy self sufficient off road riding on larger capacity trail bikes. Good to have challenges in terms of distance and terrain rather than just wide open straight gravel roads. Scenery and quintessential european-ness in terms of surroundings also important. Red Ball Run/WYOA style. the aspiration would be a N-S and an E-W route. Looks like my current N-S France route runs about 70km east of you. I've split my TET into country by country sections and now need volunteers to ride the sections to check to see if they are still open/legal/fun and also supply suggestions for alternatives/detours. France may be too long a section for one individual to take responsibility for. So we need volunteers for Far Northern Norway, Sweden (perhaps also more than 1 rep), Netherlands, Belgium (is there any legal riding there now? ), France, Spain, Portugal. When i get back send us your route ...ish down our way and i'll try and take a look. You have one volunteer for France-Spain here. I have already PM you before. Do you have any deadline? Have a great trip east - wish I was coming with you - and what about The HISS in september?